David Rickert - Page 2 of 17 - Original cartoon illustrations and Teaching Resources! It’s a pretty good bet that everyone will give a toast at some point in their life, whether it be at a wedding, a birthday party, or a retirement party. In my freshman English class, we use toasts to practice speaking skills. It all started during our unit on Martin Luther King Jr.’s “I Have A Dream” speech. While I think it’s important for students to know the content of that speech, it’s also a perfect opportunity to study how to write an effective speech. We examine MLK’s use of simile and metaphor, his terrific use of repetition of words and phrases and sentence structure, and his allusions to historical events and founding documents. Once we’ve done that the students apply what they’ve learned to a toast they deliver in class. They can choose whomever they want and whatever occasion they want. I encourage students to think of events in the future, like their younger brother or sister’s wedding. The only requirement is that it has to be for someone they know – it can’t be a celebrity. It has to be for an occasion they could see themselves actually giving a toast. We start by reading this website that addresses how to give an excellent toast. Lots of good suggestions here. It must be between 30 seconds-one minute. In real life if your toast is too long people will stop paying attention. It cannot be read (you can have notes, but can’t read them). No one wants to hear someone read a toast. As the website above says, a toast is a gift and if you don’t memorize it, you’re not putting forth the effort to show you care. It must have an allusion. Many students choose song lyrics are references to television shows. It must have an anecdote. They need to keep this short (and of course it can incorporate repetition, allusion, etc. I give them a few days to rehearse before the actual day. On the day that we give the toasts, I buy clear plastic cups and some soda because I do require them to hold up their glass and say “To ________” at the end. Three two-liters was enough for my freshman class of 24. The nice thing about these short toasts is you can get through them all in a period if you’re moving them along. Although the toast has to be memorized, I do ask that students write down their use of repetition, similes, metaphors, and the other requirements and give it to me beforehand so I can listen for them. Since I’m not recording them and they are delivered from memory, there’s no way to know if they used them or not after the fact. If they have them written down for me to look at beforehand, I can listen for them during the delivery. This has been a lot of fun every year. And I’ve actually had people deliver the toasts they’ve written. One student delivered hers at her sister’s graduation party. One student this year prepared one for a friend’s confirmation. If you’d like a copy of the toast assignment that you can use in your classroom (including a rubric) click here. Sketchnotes are becoming an increasingly popular way for students to take notes for lectures. However, there is much value to be gained from using them along with – or instead of – traditional methods like Cornell notes and annotation. Studies have shown that engaging the visual part of the brain as well as the textual part adds in retention of information. Plus, it’s fun. Here’s a personal story about the power of sketchnotes. When I was getting ready to do Sketchnotes with my freshmen, I decided to give it a try myself to serve as a model and discover any problems they might face. I did sketchnotes for the first five chapters of Frankenstein before I asked them to do any on their own. I didn’t do any more of the book, But guess what? Those five chapters are the ones I remember the best. Imagine the value of using this tool to really get students to engage with a novel or play. My sketchnote for Chapter 5 of Frankenstein. For our second venture with sketchnotes, I had my freshmen in groups of five, each doing an act of Romeo and Juliet while working as a team to make something that looked like it all belonged together. They were not as successful this time, and I learned that I can’t just show them a few models of sketchnotes and expect them to be able to get the idea. They need more structure. So I developed the visual above to help them organize their ideas before they start. 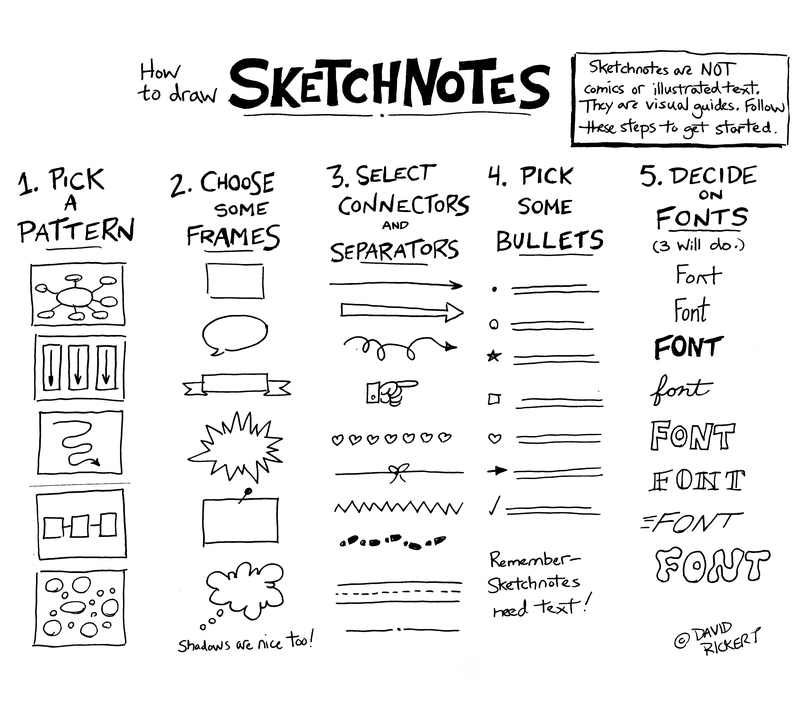 The first thing students need to do is choose an organizational pattern for their sketchnote. If they don’t, they’ll just draw a bunch of things randomly on their paper. They need to think about the ideas that they are presenting and what pattern best suits that. I always have students justify their organization pattern to me and why it works best for what they want to do. I’m not a big fan for linear patterns because what students tend to do is create a comic or an illustrated version of the text, which isn’t what sketchnotes is all about. I steer students toward either the web or the columns by asking them to sketchnote how a particular main idea or theme is present in the text. Then they might use the web, put the theme in the middle, and show several instances of how that theme was explored around the periphery. Or perhaps they use the columns by placing the theme at the top, choosing two or more characters from the text, and using the columns to fill in how those characters dealt with that theme through conflict. Of course you can use any organization method and do something cool with it, and if they want to do something more sequential I don’t mind as long as they aren’t just retelling the story. It also bears mentioning that the visuals provided are just guidelines. You don’t need to do a web as a bunch of circles or use rectangles for columns or have a specific number of ideas to work from that you can’t exceed. These are not set in stone. Next to the pattern of the sketchnote, frames are the most important organizational feature. They keep text organized and are used to create banners for important ideas. Some lend themselves to specific uses – for instance, a speech bubble could be used for important quotes. But, really any of them will do. Frames – which serve as containers and keep ideas separate while providing structure – keep the sketchnote from being too messy. You can find several other examples of interesting frames with a quick online search, especially some that might be particularly well-suited for the novel or play you’re reading in class. I also encourage students to think of frames that might come naturally from the novel – a handkerchief for Othello, for instance. Connectors guide the viewer through the sketchnote and can indicate relationships, such as cause and effect and the passage of time. Simple arrows will do the trick, and most of the choices will be aesthetic because connectors are functional and aren’t responsible for communicating meaning. However, they do provide a place for students to do something fun and artistic. While connectors link ideas, separators keep everything tidy. They don’t need to be fancy to do the trick. All they need to do is keep related ideas separated from other ideas. Generally I find that students will add these last to add clarity. Sketchnotes need text. A sketchnote with only visuals is just a bunch of pictures. The text is where the true meaning is. And bullets organize text. Paragraphs will overwhelm the pictures. And students need to remember these are notes, not a paper. That’s where the bullets come in. Just like in a PowerPoint presentation, bullets effectively present main ideas efficiently. While it’s not that important to linger over which bullets you choose, I like to include this step to emphasize that text is required and paragraphs should be avoided. While fonts are fun, they serve a purpose. Students can choose one font for headings, another font for important information, and another one for quotes. Three seems to be a good number to shoot for – anything else can become difficult for someone looking at it to process. Fonts are also a good way to introduce hierarchy by making more important words or phrases larger than others. When writing a paper we can underline, italicize, and boldface certain words for emphasis. While you can certainly do those things with handwritten fonts as well, sketchnotes also allows for the opportunity to add emphasis through size. Not everyone likes sketchnotes. The less artistically inclined would rather take traditional notes (I maintain that the just need more experiences before they are won over.) However, most students found them an effective, absorbing way to process text. Plus, they were great to review for their final paper. If you’d like the sketchnotes visual featured above as a jpeg, click here. If you’d like it as a PowePoint slide, click here.